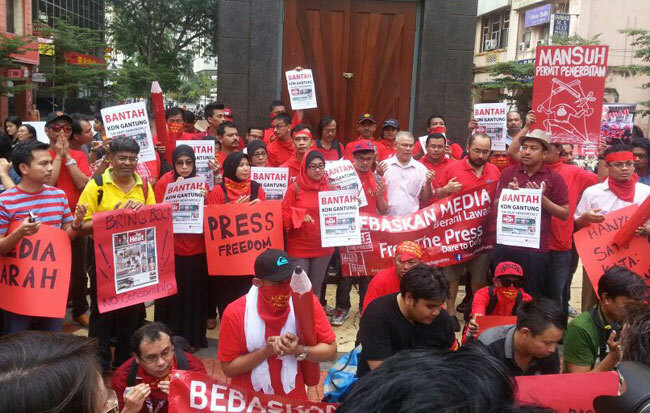 KUALA LUMPUR: Over 100 people — mainly media personnel, activists and other supporters — today gathered in the city and marched through heavy rain in the ‘Red Pencil Protest’ calling for greater media freedom. Red is the colour chosen by the Angry Media Movement (GERAMM), the organisers of this protest. The group was formed by journalists after the suspension of news weekly The Heat last month and is spear heading a campaign to pressure the Home Ministry to reverse the ban. During the protest, protesters at one point each held up a red pencil and broke them in half. This, they said, was symbolic of the government’s alleged oppression of the media. Do away with the requirement of a publication permit mandatory under the Printing Presses and Publications Act (PPPA) 1984. Allow all media practitioners to cover government events and access to public buildings for news gathering purposes. They also called for the government and political parties to give full access to government and public events, and to apologise over alleged breaches of media freedom. Aside from several political leaders and activist who turned up, there were a few individuals who turned up on their own accord. The rally, which started off at 2pm at the Bar Council office in Jalan Tun Perak, proceeded to the Masjid Jamek LRT station where several journalists, including reporter Radzi Razak, were allegedly roughed up by police during the Bersih 3.0 rally in 2012. 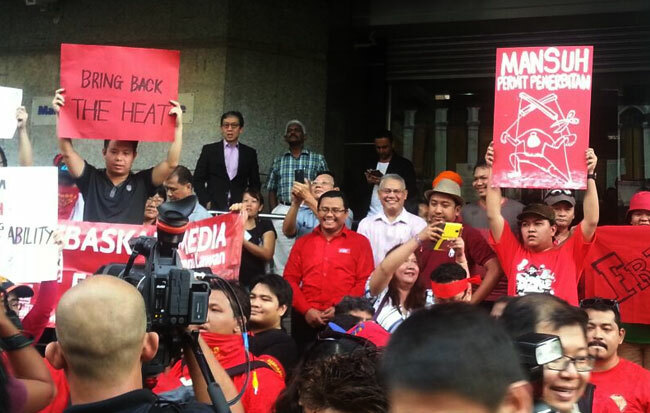 In his speech, organiser and Malaysiakini editor Fathi Aris Omar said that the rights of the media should be returned, and the act of breaking the red pencils was symbolic of the sufferings of the media that has been oppressed by outside forces. The protest was held by GERAMM following the suspension of The Heat by the Home Ministry in Dec 19. Though the suspension was widely believed to be over a frontpage article on Prime Minister Datuk Seri Najib Tun Razak, the ministry has denied this claim. The Home Ministry has insisted that The Heat had violated several clauses in its printing permit, including the changing of ownership and the alleged failure to explain its actions. However, the government had also reportedly told The Heat that it was in the midst of considering lifting the suspension.